When I had this blog for the first months, I had no idea if I should submit my website to Google Webmaster Tools. I got a wordpress blog set up, and that’s it, I thought only creating posts that I love to do is enough. I had 0% SEO knowledge. Finally, because people started to comment to my website, I also visited their blogs or websites. Some of them who have blogging tips niche, posted some articles about Google webmaster tools. I visited this web page, and I have read what it is about, then I register this website, with my gmail account. This blog is actually my first website or blog that I submit to Google webmaster tools. The very first thing I did, after I logged into my account was submitting sitemap.xml to Google. And then I left it a few days until some datas from this blog are fetched there. At first, I have thought, I did not really pay attention on my Google webmaster Tools account, because I did not know what the use of it. I strongly recommend that if you have a wordpress blog, submit your site there, to check some stuff that is very important to re-check, as a webmaster, which is you, the blog owner. Not only it is important to monitor your Site for getting Google traffic (related: get 1000 visitors a day, and fix webmaster tools 404), but it is also important if you have some errors, so you can fix them. I have a client who asked me to register her site in Google Webmaster tools, but she has never checked it. I can’t check it either, because I registered with her email address. Whenever I asked her, to check her accounts in Google Webmaster Tools or Google analytics, she just said, yes, will do, but she never does it. I really suggest after you submitting your blog, you should check it once in a while, at least once a month. I personally check it frequently about once a week. I will tell you why..
A few months ago, I had an slash URL errors which was caused by W3 Total Cache, and that caused duplicated contents in this blog. The result was, my traffic did not drop, as long as I remember, because I checked my Google webmaster tool, and fixed the errors. From this story, imagine, if I did not checked my account, I would not know if my blog has some of these errors, and this blog might be de-indexed from Google search results, and penalized. That was one of my experience that makes me thinking how important checking your account regularly. The other issue was, I had so many posts that are not indexed by Google. I have wrote why my blog post was disappeared from Google, and this case, was caused by my robots.txt file. The posts that were not indexed, were, all posts which have the title and url: “wp” because it was restricted by my robots.txt. I had no idea why those posts are not indexed either, until I checked my account. In GWT, it notifies me which posts are restricted by robots.txt and then I fixed it. Soon, my posts were indexed by the big G. Another part, is, checking and blocking your sitelinks if you have a few already. (see my blog has sitelinks). 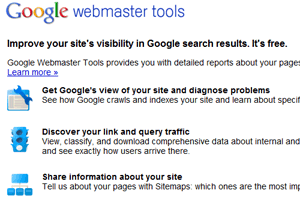 I have checked my Google webmaster tools frequently, and I suggest you do the same too! ← Importance of sitemap for SEO in WordPress – Should I have a sitemap? This was a well timed post, however I still don’t understand how to rectify the crawl errors. I have some identified but WM Tools don’t make it clear how to remove the error. Are you able to help me? I’ve taken a look at your post ‘404 not found WM Tools error’ but I don’t understand your explanation. Do Google have a training video? No, I don’t think Google has a video tutorial on this. I suggest you to ask your host for a help. Sorry, I can’t help this time, as I am very busy at the moment. Hmm.. Haven’t checked it for a while, perhaps I’ll take a look! Thanks. How are you? hop all is well. Just want to say thanks for this Google Webmaster tools information. I suppose a lot of people don’t do this and they should. I am great, thanks! I hope you are too. I am so sorry that your last comment a few weeks ago was accidentally deleted, because I use wp optimize, and forgot to tick off “the pending” comments to prevent automatically deleted. The result was, my pending comments at that day were all deleted from my database 🙁 including yours.. Thanks for coming across, Terry!